Mali Mish – Day 47: Wildlife and working in Naples. We checked into Collier-Seminole State Park yesterday without really looking into what was available. We knew pretty much about what to expect since it was a state park. We have been traveling almost every day since we got to Florida, we needed to settle down somewhere to catch our breath a bit so we registered for 3 nights. First night at the Collier-Seminole was pretty uneventful. One of the first things we noticed is that our Sprint reception is pretty much non-existent here. That is a small problem for us since we need to stay in touch for work purposes. No big deal we thought, we could just head into town and camp out at the coffee shop and use their wifi for the afternoon. So that is what we decided to do with our first day in the Naples area. Before we headed into town, we took a stroll around to park to see what it has to offer. First was the visitors center in this 2 story octagonal building. It had a small display explaining how an advertising tycoon Barry Collier owned nearly 1 million acres of land in the early 20th century. 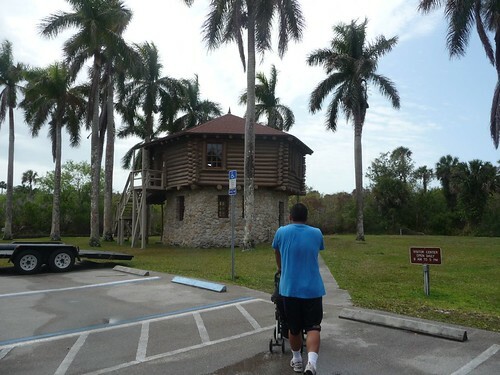 He was instrumental in the building of the Tamiami trail that connected Tampa to Miami through the Everglades. He also intended on donating the land this state park currently sits on to the federal government for the establishment of a national park. 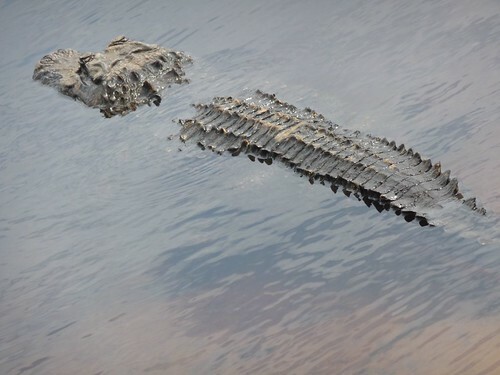 They respectfully turned him down so it was subsequently made into a Florida state park that bears his namesake today. Collier-Seminole State Park is a great place to come if you wish to take guided canoe tours through the wetlands in the area. They depart daily and last a couple of hours. It is supposedly a very informative and interesting tour. Since we have 2 little kids, we could not go on the tour to find out first hand. 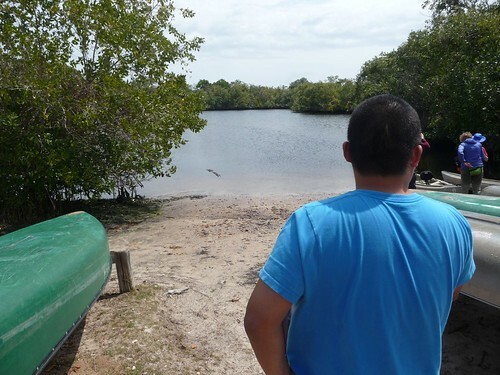 The best we could do is to walk down by the boat ramp to check out the water and hopefully find some wildlife. And wildlife we found. Look at this little guy. He was sitting just a couple feet from the edge of the water where the canoes are launched. If you look back at the photo above, you can see his body barely visible at the surface of the water. We were pretty excited as this is actually the first wild gator we have seen since we got here to gator country. I am hoping to see some more but the ladies aren’t as enthusiastic. On the other side of the boat ramp we found this guy perched atop a dead tree. From this angle it is hard to say exactly what kind of hawk it is. 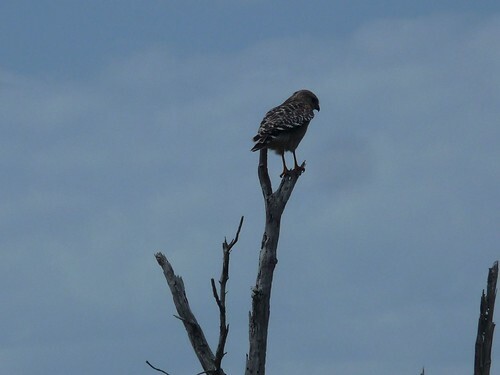 It looks like it might be a red shoulder hawk from what we can tell. But enough of that, now its time to get some work done in town so we headed into Naples for a cup of joe and some wifi action. We are constantly trying to find ways to keep the kids entertained. It is especially difficult if we are busying working on something else and can not entertain them ourselves. 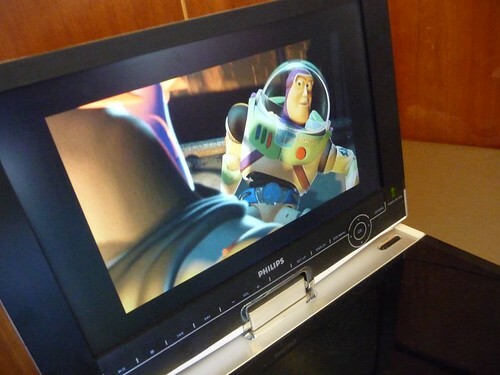 One of the big cop-out tools we use, and we do feel a little bad about it each time we use it, is the portable DVD player. 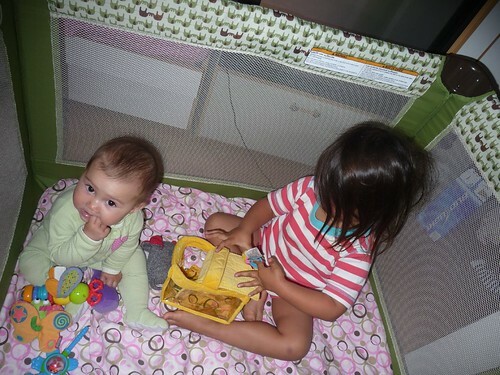 Today, Ava’s friends Woody and Buzz are doing the babysitting duties for a couple of hours. After a couple of back breaking hours hunched over at the little tables in the coffee shop, we did some grocery shopping at the store nearby. As you drive across the country, you start seeing your favorite regional grocery stores slowly disappearing as new ones pop up. At home we have Vons, Ralph’s and Alberstons. Here in Florida, we are looking at Publix and Winn-Dixie. 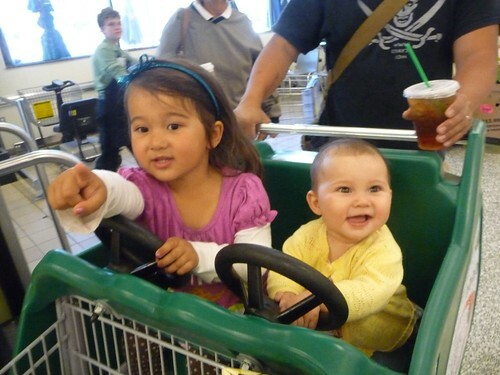 Mila here is sitting in the child seat of the shopping cart for the first time. 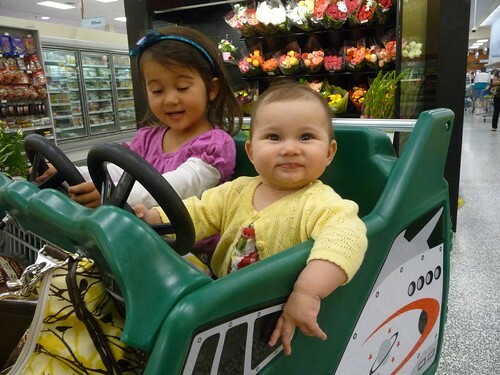 She has recently been sitting up really well all by herself so we upgraded her on this visit to the shopping cart seat next to her big sister. As the sun was setting, we saw more wildlife now have gathered at the park. 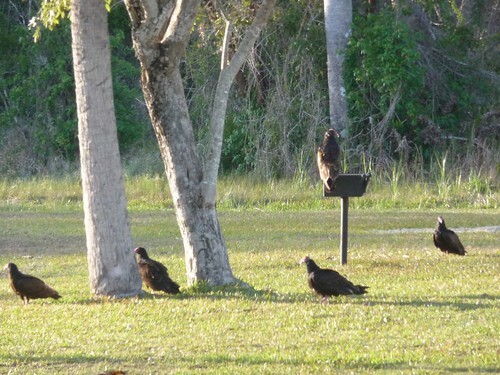 Here are some black vultures waiting for people to come BBQ. 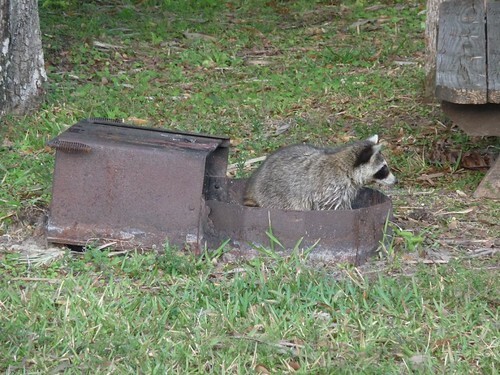 Here is a raccoon actually sitting inside a BBQ. It is rare to see them during the day as they mostly roam about scavenging in the dark of night. 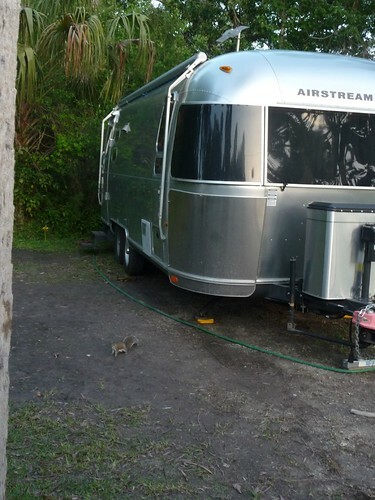 A squirrel by our Airstream is looking to see if we dropped any nuts. Sorry Chip, no nuts here. 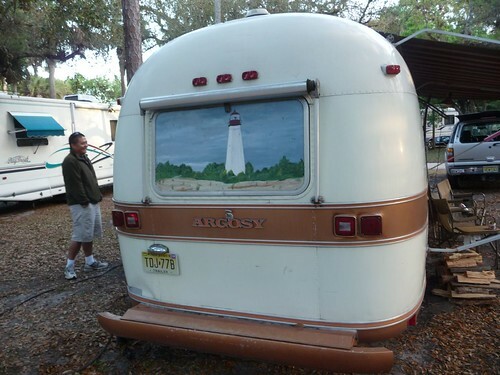 Yesterday as we settled into our site, we saw this beautiful Argosy pull into the campground. it turns out, the owners had also seen us just a few days ago at Cody’s RV Resort in Weeki Wachee. Pat and his wife are proud owners of 3 Airstreams. This 30 foot Argosy is their workhorse that gets to leave their home base of New Jersey with them. They are on their way down to the Florida Keys and they gave me and Ava a little tour of this beautiful 1960s vintage trailer. Ok, time for a bed time story. See you guys tomorrow! 3 Responses to Day 47: Wildlife and working in Naples. I am so happy to have found your blog! Will definitely follow along and collect all the tips you guys are sharing 🙂 We drove from New England down to Lakeland last October, then stayed in Lakeland (for work), Sanibel, Key Largo and Orlando. Working hard now to return next month, and Ft. Myers/Naples area is where we are hoping to have our FL home base. Thanks for the State Parks tip, I’m now following them too on Twitter . Thanks for reading! 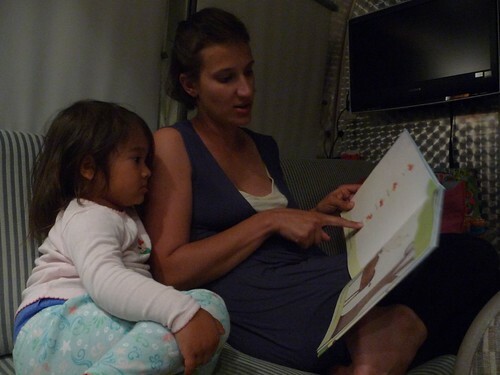 Our Airstream is a 2007 25 foot FB (Front Bedroom) International ‘Ocean Breeze’.